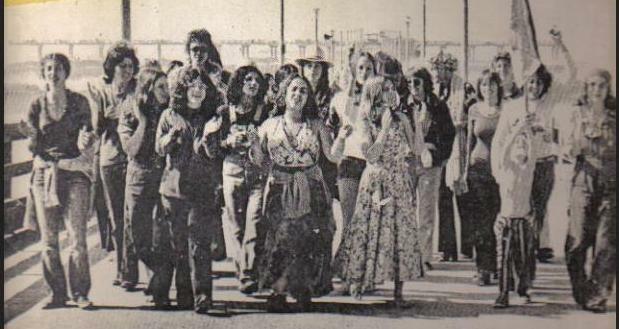 Where Are these Women Activists of Yesteryear’s Ocean Beach? Where are these women activists of OB’s past – from the ancient year of 1975? The above photo is a cropped version of the photo on the front cover of the OB Rag, March 1975. OB Rag staff organized this photo shoot on the OB Pier for the Women’s Day front cover. If you recognize anyone, please let us know in the comments, and let us know if you know what they’re up to these days, if they have prospered and survived, or … – as it is true, a couple have not survived. I heard that Norma Marks, 4th from left, was just in OB and had a birthday. From L to R: don’t know, Carol B, Bonnie E, Norma M, Maria, Chui, Kathy S in hat?, Miriam, Sierra, unk, unk, unk, Rise, Paul L, Nancy L. How’s that editordude? “From L to R: don’t know” The woman on the left is Terry Hoffman (i think she has a married name now). She was the cousin of our dear Doña A., who sadly passed away in Nov. 2014. Terry hung out with us in OB from qquite a bit while a student at SDSU. I believe she is in Colorado. If you see this Terry, get in touch if you would. I think the other person who still lives in OB is Bonnie E.